From Alice to Ocean is the astounding story of a twenty-seven-year-old Australian woman who set off to cross the desolate outback, accompanied only by four camels and a dog. It was a trip that began as a pure and (many said) lunatic gesture of independence and quickly turned into an all-out battle of wits against the forces of both nature and civilization. Cocky and outspoken, Robyn Davidson’s tale is at once the probing journal of a daring and stubborn woman and a wilderness adventure of the most exhilarating sort. Rick Smolan, the photographer, had his own adventure tracking Robyn down to document her trip for National Geographic magazine. The outback of Australia, seen through Rick’s cameras and Robyn’s words, is an ancient awesome landscape swept by rain, heat and dust and inhabited by all varieties of marauding life, from poisonous snakes and wild bull camels to swarms of tourists clamoring after their newest heroine, the “Camel Lady.”…When Robyn and her caravan reach their destination six months and 1700 miles of outback later, their arrival marks the end of a true odyssey and an unforgettable book. As I look back on the trip now, as I try to sort out fact from fiction, try to remember how I felt at that particular time, or during that particular incident, try to relive those memories that have been buried so deep, and distorted so ruthlessly, there is one clear fact that emerges from the quagmire. The trip was easy. It was no more dangerous than crossing the street, or driving to the beach, or eating peanuts. The two important things that I did learn were that you are as powerful and strong as you allow yourself to be, and that the most difficult part of any adventure is taking the first step, making the first decision. And I knew even then that I would forget them time and time again and would have to go back and read those words that had become meaningless and try to remember. I knew even then that, instead of remembering the truth of it, I would lapse into a useless nostalgia. Camel trips, as I suspected all along, and I was about to have confirmed, do not begin or end, they merely change form. As with all your posts, a beautiful story. Those of us who consider changing our lives need stories like these to give us courage–that anything can be done–it’s not that hard. I think the hardest thing is the fear–fear that I’ll fail, fear that I’ll be destitute, scared, and alone, and fear that I’ll look back and regret quitting my job. I need stories to help me conquer my fears, which are bigger than any real life challenges. I think those are feelings we can all relate to, Paula. Be sure to watch Rick’s TED talk in his comment below yours for another inspiring story. Naj, loved your column and the pleasure is all mine. Robyn changed my life and the lives of so many others the least I could do is share my book with you. At the end of Robyns journey she asked if I was going to go back to being a hired gun – waiting for other people to tell me what to photograph, what to care about, or if I was going to find something I cared about (like her) and use my skills as a photographer to tell that story. Rick, that is an incredible story! Thanks so much for sharing it. The ripple phenomenon of how each person can affect others, and the continued radiating outward, is amazing to me. 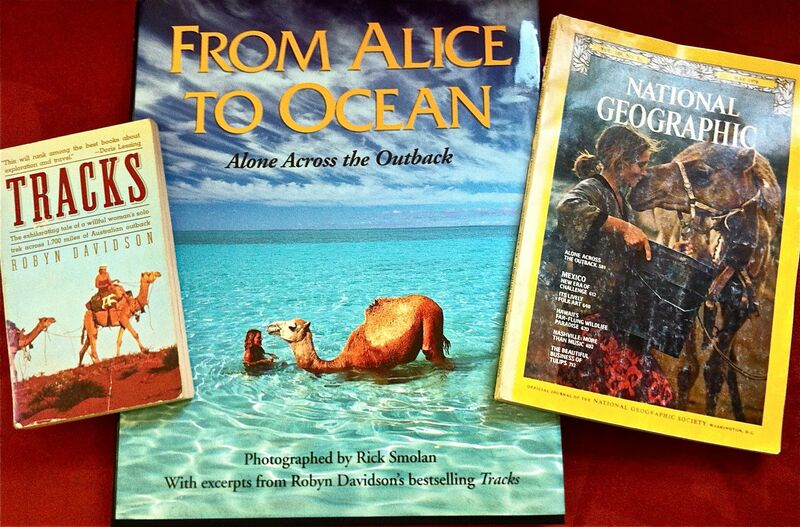 I have a copy of this very National Geographic on my bookshelf! Robyn’s story always inspired me to disregard fear and just LIVE life as I want to live it. I’m so happy to see that her influence has travelled far and wide. Thanks for sharing. I love that you’ve kept that story close by too! She’s definitely an inspiration as I slog my way through building obstacles – puts things in perspective. Thanks for letting me know. The theatrical release of the Tracks movie has just been moved by The Weinstein Company to late oct/early November. A MUCH better time slot which bodes well for the film and expectations that Mia Wasikowska may get an Oscar nod! I saw “Tracks” at the San Francisco Film Festival and I was really moved – it is a gorgeous and emotionally powerful film. I’ve been waiting to see it again during it’s U.S. theatrical release, they moved it to Sept 19, but now if Weinstein is going to move it even later I guess I’ll have to wait longer. It’s worth it if the film gets a big push and more people get to see it. Not only does Mia Wasikowska give a great performance (what an amazing talent) but I feel the film really touches on some profound points. This film is an antidote to so much of what ails our AD/HD society. It’s a great film of lasting value.